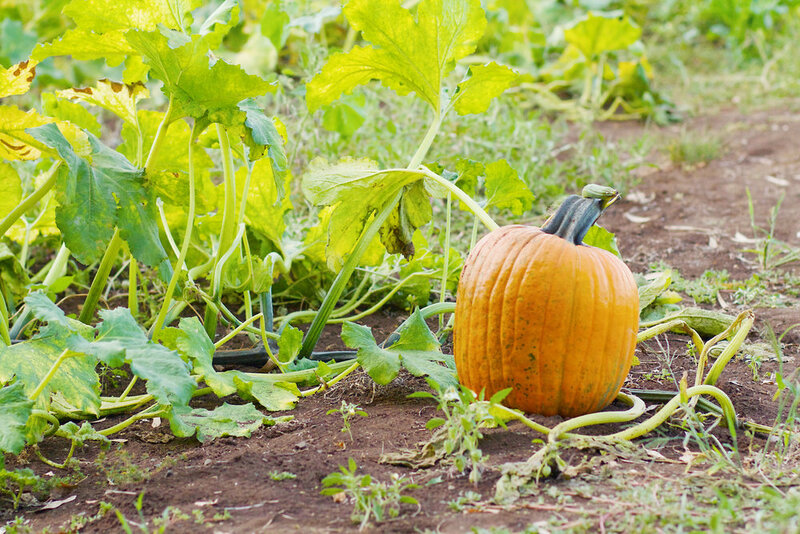 It's the first weekend of October so pumpkin patch season has officially started. I have to say that I felt pretty lucky to live in California as I drove through an abundance of fruit and nut tree farms to get to TJ Farms Estate. Not everyone gets to experience farm-to-table so easily, so I don't take for granted eating seasonally. While arguably Autumn isn't quite as fun as Summer for produce, I still love squash season and all the pumpkins it brings. Summer weather is lingering around here, but decorating with pumpkins helps to will in the Autumnal bliss, so I'm sharing a few fun ideas to get creative with your pumpkins from the patch! I love succulents because they're super low-maintenance and oh-so-pretty! I have plenty of succulents around the house and front porch, so I recently tried swapping out pots for pumpkins to create these lovely little pumpkins. I simply carved out a hole on top, scooped out the contents of the pumpkin and cleaned the insides, then plopped soil and a succulent inside. Easy peasy! I saw this idea at Oktoberfest years ago and loved it! It's a fun way to swap out traditional vases for a seasonal bouquet. Clean out a large pumpkin and place a cup inside with water and fresh flowers. I find placing a cup inside with water helps prolong the life of both the flowers and the pumpkin. You can also use dried flowers and it's still pretty gorgeous! This is actually an old snap, but who doesn't love donuts? The idea came by accident when I was a table with a mess of baking and craft supplies with some friends. I used a small white pumpkin, paint and some clear-dry glue and sprinkles -- and voilà! Happy Autumnal Equinox! What are your favorite ways to decorate with pumpkins?